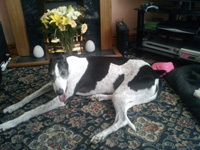 Went to his new home on Saturday 3rd April 2010. 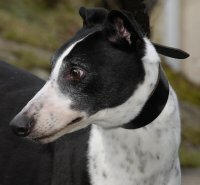 Sadly Tam arrived back on Monday 30th April 2012 due to his owner's declining health. and became the branch's 3rd long-term foster dog. 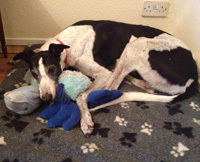 Tam was originally fostered with Julia, her family and their labrador and lurcher until he found a new home with an elderly gentleman whom he lived with for 2 years until the gentleman's health began to decline. As it was deemed in Tam's best interest he be returned to Rescue and we found him another home where he lived for 9 months. Sadly due to a change in family circumstances and Tam escaping from the back yard with the gate not being properly shut and him meeting a strange dog. 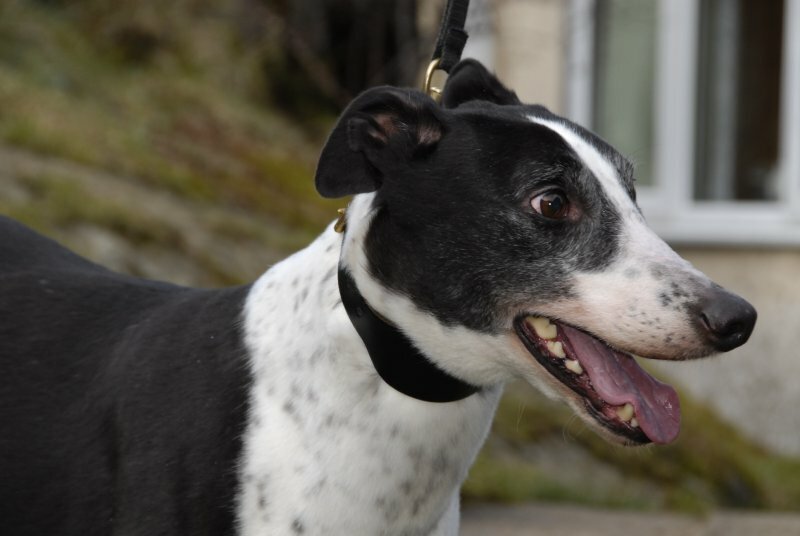 Tam was once again returned to us and we are now looking for either a long-term foster home or a forever home for him during his twilight years. 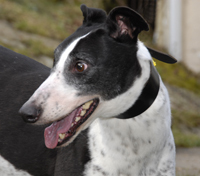 Tam is a beautiful black and white ex-racing greyhound who was born on the 6th September 2002. 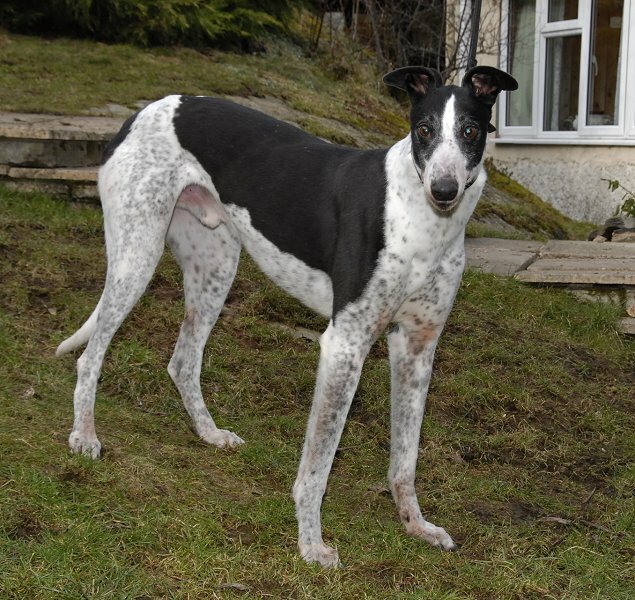 He was the Racing Kennel's mascot and often visited friends houses and the local pub. He is house trained, neutered, inoculated and microchipped, walks nicely on the lead, travels well in the car, is a lovely, adorable companion who we hardly know we have in the house. 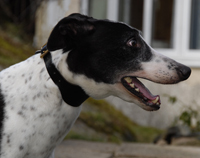 Tam is fine with other breeds of dogs once he gets to know them, but he is best muzzled during any introductions and while out walking in case any loose, strange dogs should come too close. Tam is not an aggressive dog but is scared loose ones will hurt him, so in his case he feels he has to get them before they get him. Stuart collected Tam this morning and brought him to our house until Julia could collect him and everything she needed to foster him. 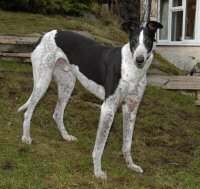 He travelled well in the car and upon arriving here he greeted our greyhounds one at a time so as not to bombard him then he had a walk around the garden on the lead to do his toilet before bringing him into the house. He was a little bewildered at first so we put all our greyhounds behind the safety gate leading into the living room and tied Tam to the hook in the kitchen by the side of the fire so he could lay on the dog bed in peace and settle. The only other dog in the kitchen at the time was Sapphire who came here with him and who is going to her new home later. We gave him some food then took him in the garden again to do his toilet and settled him in the kitchen to wait for Julia to fetch him. He's a bit of a messy drinker with water spreading all around the bowl as he's lapping it up, but we think that could be nerves and will settle. When Julia arrived we microchipped him, took his photo and escorted him to her car. As the back of the car was quite high we lifted his front legs onto the back flap then lifted his back ones up to help him jump in, and off he went to his new foster home. We received an email from Julia during the evening to let us know that Tam and her dogs were fast asleep. She took them all for a walk through the woods when she got back and put the muzzle on him as we suggested while he got used to her lurcher and Labrador. They got on fine with plenty of waggy tails from all 3 so the muzzle was hung up again! Tam was anxious to start with but settled down towards the end of the walk. He has been bleeding slightly from where he was microchipped so Julia bathed the dried blood away and will keep my eye on it. Tam was a little unsure of the stairs but when he saw Julia's dogs go up them he followed going up 3 at a time so she is going to be very careful to hold him when they try to go down them later in case he goes down them too fast. Tam has walked around the garden and then the house. He found the water bowl and while drinking water was splashing it all over - poor Tam, bless him! He's been wandering around with Julia's two dogs and gave her a lovely waggy tail when she went over to them. He has helped himself to the bone pile, putting them all in and around his bed, then went for a sleep - flat out after a busy day. Julia emailed this evening to let us know that Tam was good last night. He barked at 5am to be let out and this morning she took them all for a walk. Tam was a little anxious going down the stairs but he did them slowly alongside Julia's labrador called Hazel. Tam seems to be such a lovely, quiet dog. Still splashing the water all over the floor so the mop is coming in handy! All dogs went to asleep after their walk and the area where he was micro chipped seems okay this morning. Julia emailed today with an update of how Tam is getting on. She says he's made himself at home, is much more settled and his drinking isn't quite as frantic, the splashes don't go as far and the towel she put down is catching what goes astray. 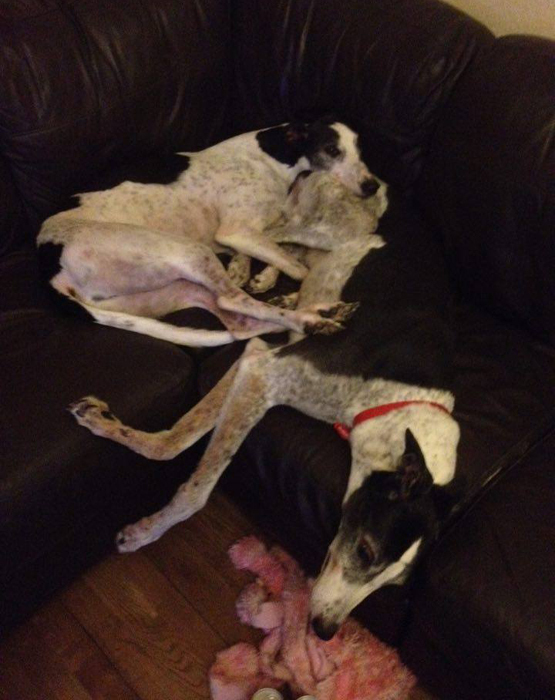 She says he is such a gentle, calm dog and she couldn't have wished for an easier one as her first foster dog. Yesterday Tam came rushing in the kitchen and slipped on the floor, which frightened him - and Julia! It was a bit of a scary moment but he hadn't hurt himself, but more scared himself. He just lay on the floor and didn't try to get up so Julia got the door mat and slid it under his feet so that when he stood up he had more grip. To prevent this happening again she put their caravan awning floor covering across the kitchen floor to give him some grip and she is going to get some mats for the kitchen as soon as she can, but the awning works in the mean time. Earlier they all went for a walk up the fells to the back of Canny Hill where Julia's dogs race around, but Tam was happy to just plod along with on his lead and didn't bat an eyelid at the other two racing about. Back from their walk he slept. Again he settled all night and has only had one accident in the house and that was when he first came, and was a bit stressed. They took him with them to take their daughter to the school bus and the children and other parents enjoyed stroking him. Again, he was very calm as if he did it every day! Received an email today letting us know that Tam and the other two dogs went to Ulverston today because Hazel, their Labrador had an appointment with the vet for her monthly allergy injection. Tam jumped effortlessly into the back of the Land Rover after the other dogs and Julia was so pleased because when he first saw the vehicle we had to help him in - he's obviously feeling a lot more relaxed now! 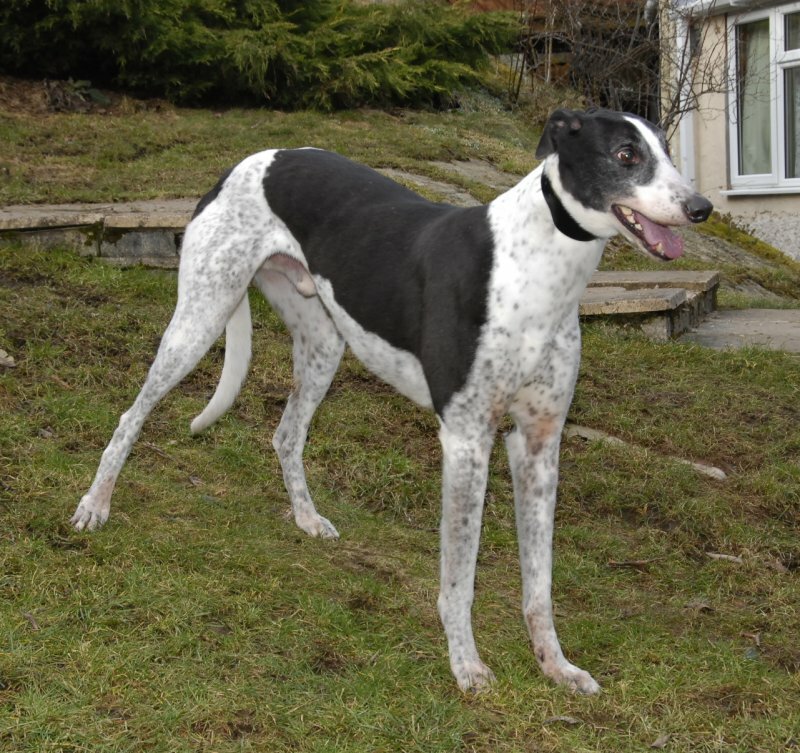 Tam then stayed with Shan, their lurcher in the car while Julia took Hazel into the vets. After the appointment they all went for a walk along Bardsea Beach and through the woods. Tam was so well behaved and happy to walk along on his lead next to Julia until some of the sea birds made him jump when they suddenly flew out of the reeds. On their return to the car he again jumped in the Land Rover with no bother and they all went home. 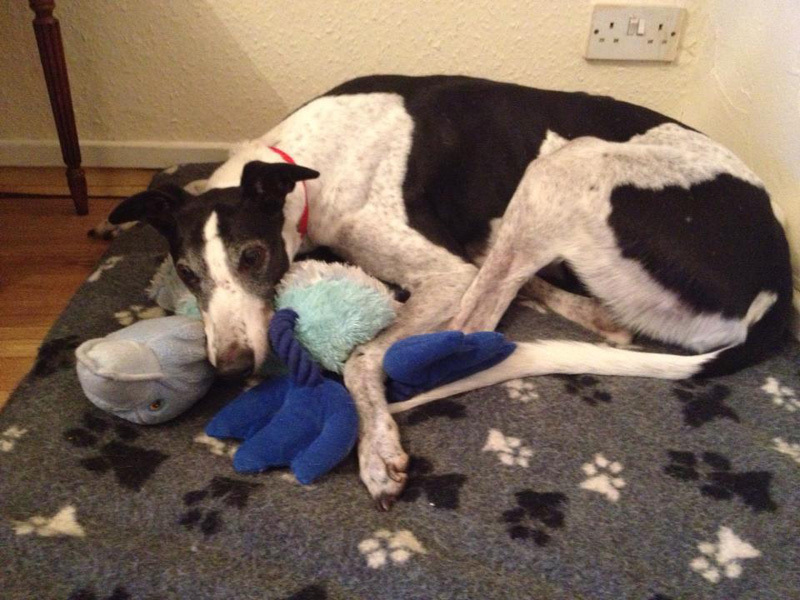 This morning we did a home check for an elderly gentleman who was interested in re-homing Tam. We took Tam with us and because all was okay and everything sorted Tam stayed with the gentleman. 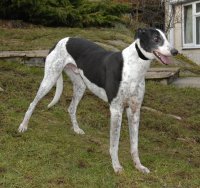 Tam and the gentleman will make nice companions for each other and we wish them a long, healthy and happy life together. We had a visit today from Tam's owner who called for another muzzle because Tam had eaten the strap off the other! His owner wanted to bring him to show us how well he was doing, but he wouldn't jump in the back of the car. He'd not been in the car a while with the weather being so bad and his owner had bought him a ramp to help him in the back, but this morning Tam was having none of it and wanted to stay home - so he did! 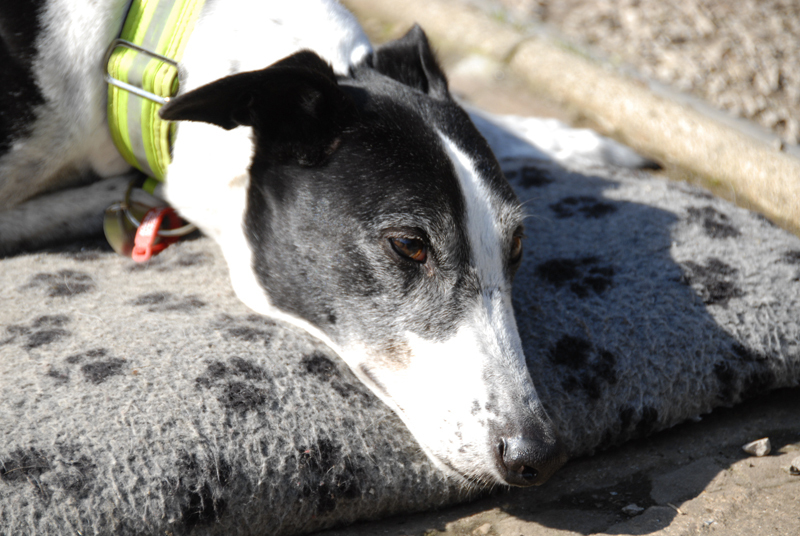 His owner, however, brought us some photos of him laying on the lawn in the summer and he looked fit and well and listening to his owner talk of Tam he is well loved, which is nice to hear. We received a phone call from Tam's owner this morning letting us know that because his health was declining he was finding increasingly more difficult to walk and look after Tam. After much thought he realises it is in Tam's best interest that he comes back to us so we can find him another forever home. He said it would be a very sad day because he and his friends all think the world of Tam. This lunch time Tam's owner brought him here along with all his belongings. It was a sad occassion but I reassured him we would find Tam a nice home and should he wish to ring us to see how he was he was welcome to do so anytime. Tam soon settled in with our greyhounds, found his bed I'd put in the living room for him. It was a nice afternoon so the conservatory door was left open and he wandered in and out the house to the garden with the others during the afternoon. Tam ate his dinner, wandered around the garden again then settled down for the night. He's a gem! Tam is at last coming out of his shell - this evening as we let them in the garden last thing, it is the routine that as they come in I sit on the step in the kitchen and give any who want one a stroke and a cuddle before they go to their beds for the night. Tonight was the first time Tam hadn't gone straight to his bed, but came with the others for his cuddle. He has been so quiet and shy since arriving back that it was nice to see. Tam went to the vets this morning for his dental where he weighed in at 34k. They removed 8 teeth, had a look at the blocked saliva gland and drained it. The vet suggested it would more than likely fill up again and if it did we should think about having it surgically removed. He has a submandibulous cyst on the salivary gland on the right hand side of his face. This can be done once his mouth has healed from the dental to avoid infection and can be dong in 3 to 4 weeks time. 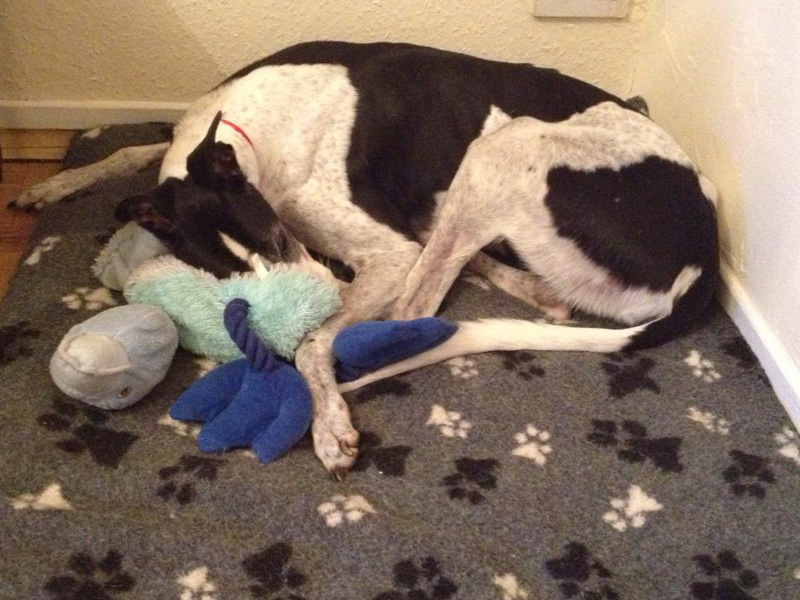 When Tam arrived home from the vets this evening he was very wobbly and just wanted to sleep near where we were. 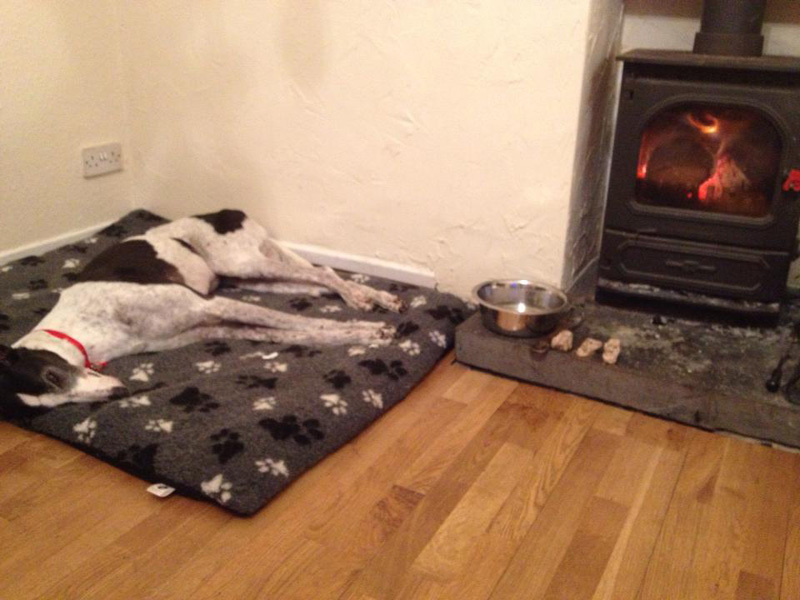 We shut all the other greyhounds behind the kitchen gate and placed a dog bed in front of the kitchen fireplace. At first he wasn't settled and he felt cool, so we put a fleece bedding coat on him and covered him with a blanket, which he cuddled into. His mouth was bleeding a bit so we placed some kitchen towel under his face to catch it and replaced it regularly to make it more comfortable for him. He didn't want anything to eat and only drank a little, so after we got him out to do his toilet last thing we left him in peace all cuddled up. Well Tam never moved an inch all night and was still in his bedding coat and covered with the blanket as we left him last night. He looked much brighter this morning and was wanting to go and do his toilet in the garden with the others. He was quite hungry and ate his food well, which was tepid and thoroughly soaked till soft so as not to hurt his mouth or damage the stitches put in to heal the sockets. This morning Tam went to the vet for a routine appointment to see how his mouth was healing following his dental last week. The vet was very pleased with the progress and advised that whoever re-homed him should clean his teeth daily to help him keep the rest. When Tam first arrived back here he wouldn't entertain walking across the tiles in the conservatory to go in the garden. Then I remembered he didn't like the flooring at Julia's when she fostered him and his new owner said he fed him in the small hall with the stone floor because he wouldn't go on the tiles in his kitchen. I remembered thinking at the time this is goig to be fun because it is the only way to the garden and back in again. We used to have a long runner going between the doors for dogs to walk along, but this was now well worn out and it was on the list to get another the next time we visited the shop. We oly have two small mats at the moment which wasn't enough reassurance to Tam to attempt to cross. To stop him from slipping or being pushed by the others as they ran in and out I put a single duvet on the floor, anchoring it down with all the table and chair legs. This looked rather odd, but was perfect. and he soon gained the confidence to run in and out with the others. Over a period of time we allowed the duvet to move so more and more tiles were showing and then we removed it altogether, so only the two small mats were left. Tam now has the confidence and knows not to claw the tiles, but to walk normally on his pads and it's lovely to see him crossing the tiles from the kitchen to the garden as the others do. He is still wary of the others pushing past, but a sharp growl or grumble from him warns them to not push him around. This morning Tam went to the vets where he had an operation on his saliva gland, which was very swollen and probably causing him pain. The vet removed it and stitched him back up. When we collected him this evening he looked quite bruised and it may have looked worse with him being shaved around his neck. However, he seemed to take it in his stride and when home he did his toilet in the garden, then we settled him for the night. The couple who Pauline did a home check with this morning wanted to come here with them when Pauline collected Abel. 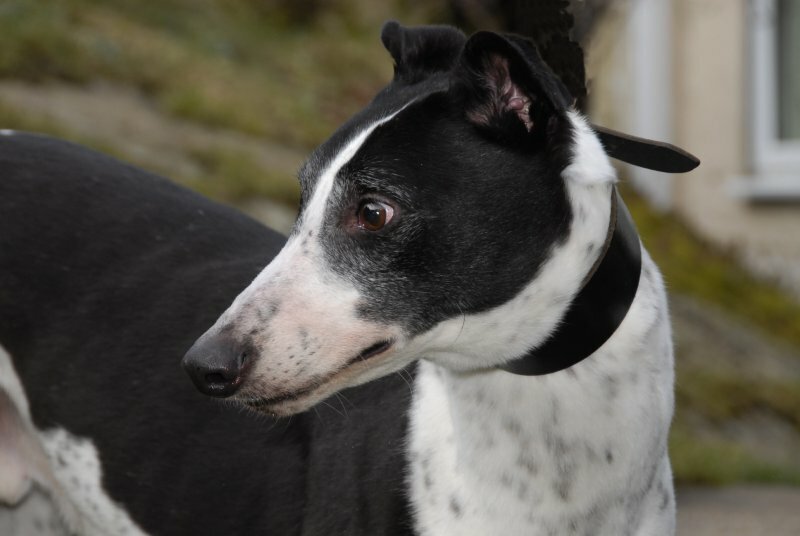 They'd had a look at the dogs on the web site looking for homes and fell in love with Tam. They took him for a walk with their other dog Geri and because they both got on well they asked if they could adopt him. They were so keen they wanted to take him home with them. He still has his stitches in following his saliva gland operation, but they said they would keep an eye on it and arrange for them to be removed. Everything happened so fast, but adoption forms signed and new coat bought for him off he went. The house seemed strange without Tam because he is a real gentleman and quite a character, especially since his dental and saliva gland were sorted. 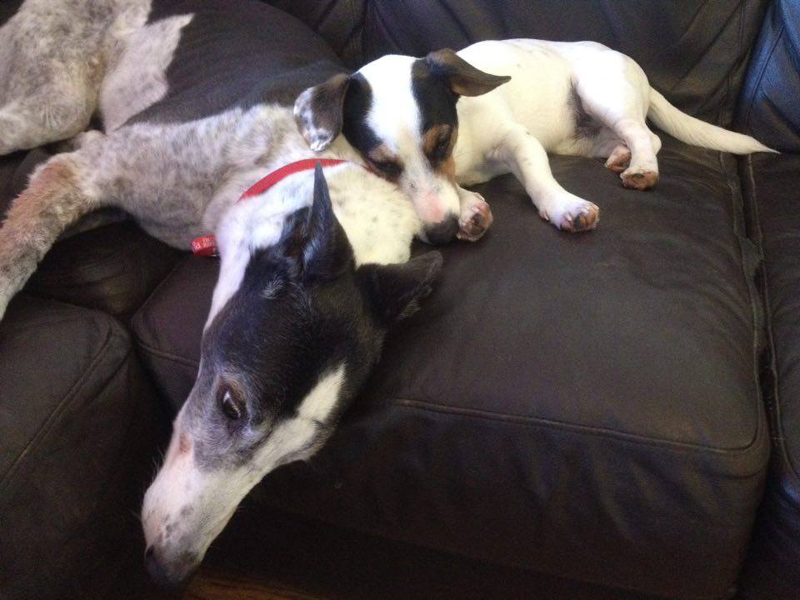 We received an email this evening from Tam's new owner saying they now have their very own Tam and Geri! They love him to bits and he is a dream. Received an email saying Tam loves living in the new house they've just moved into. He has a garden, a yard and the beach at the end of the street, he is really coming out of his shell. Tam's owner moved house recently, which went okay and the house is a stones throw from the beach. They have a separate piece of garden over the back street too, and the dogs love it. . . and again. .
. . and again . laying on his new bed. . . and now asleep! 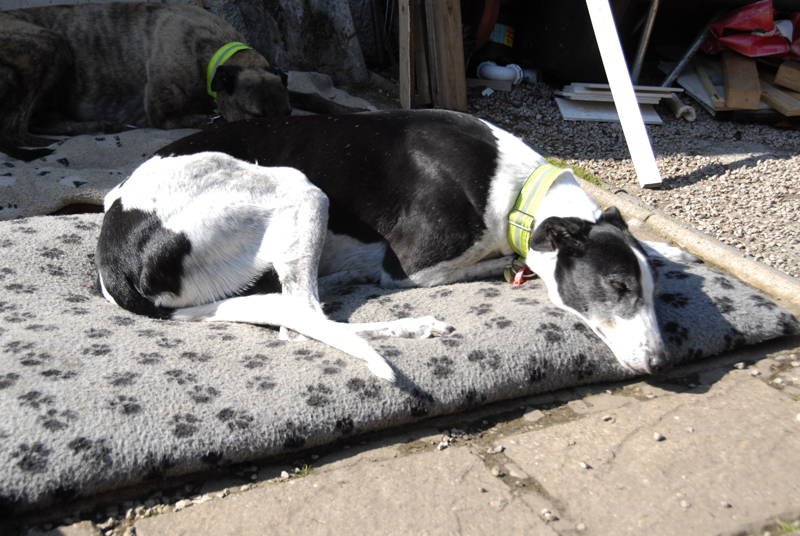 adores Tam and alway runs along side him trying to egg him on for a chase, but no luck so far! Tam's owner now looks after two puppies on occasion and she's slowly getting him used to them ensuring at fist he wears his muzzle. 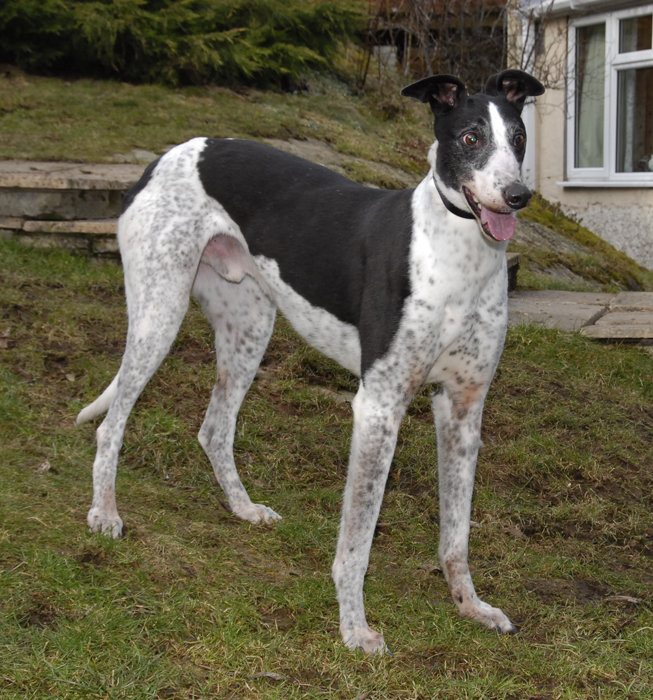 He now goes for walks with them, and they went to town last Thursday with Tam, Geri, the two pups, and another lasses whippet called Bozo. Tam, bless him, really enjoyed himself. Last night we received an email asking if Tam could be returned to Rescue and despite a phone call this morning to try and resolve matters he arrived back at lunch time. It was an unfortunate accident that the yard gate had been left ajar and Tam got out, spotting a small dog further along the back road he went for it, stitches were required and 'words said'. 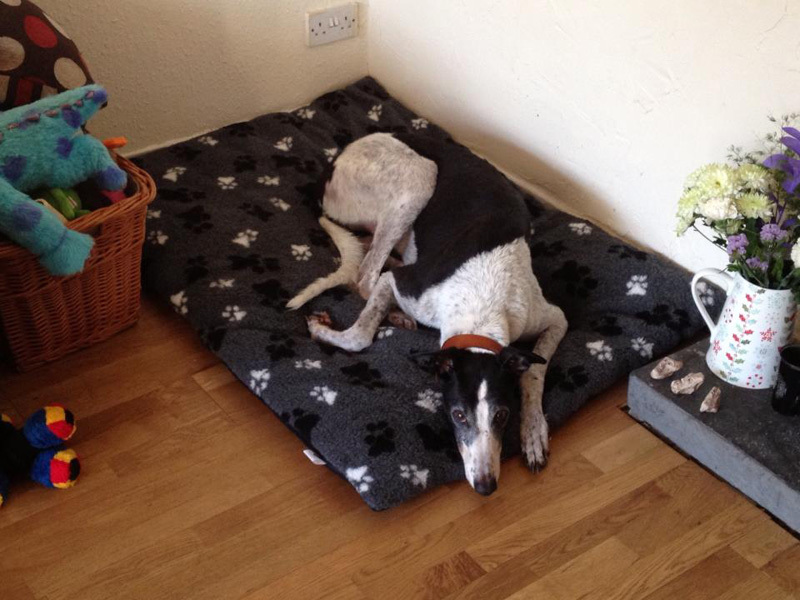 Tam arrived looking very unsure of what was happening and with his back legs shaking, bless him. Once all the 'Transfer of Ownership' paperwork was completed he went for a wander round the garden, met Indi, Solo and Sandy, all of whom he knew and this settled him somewhat. The rest of the day we slowly introduced the others to him and if he wasn't wandering around the garden he was laid on the dog bed in front of the kitchen fire. Tam ate his food the first few days he was here, but today he didn't eat anything and couldn't be tempted. Because Tam never ate anything yesterday we gave him some bread and warm milk this morning, which he loved, so we gave him the same this evening. This morning we gave him some softened biscuits, a little dog meat, some bread and milk and water. He loved it, so we gave him similar this evening. This morning we gave him some softened biscuits, dog meat, a little bread and warm water from the kettle - and he ate it all, and likewise this evening. Not sure what put him off his food, perhaps it was leaving his other home and coming back here, or perhaps he was adjusting to his position within his new pack! Anyway, he seems much better now and is even running around the garden with the others and barking at them to put them in their place. 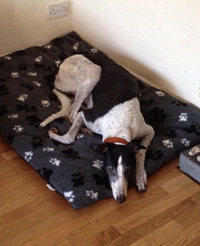 We received an email today from Donna who is long-term fostering Tam. She says Tams doing fine, he sleep well and has been no bother today . He's eaten all the food we've given him, he doesn't seem too great on his back legs and seems rather stiff , so this they will keep an eye on. We heard today that Tam is doing fantastic . He's walking extremely well now, and just this week has started going on the sofa. Mike's 'stole' him because he sleeps on his bed every night. We received an email today letting us know that Tams getting on great with the others. He seems even more relaxed this week, and he's even been better on the tiled floor which is good. Tams great, His foster parents and the dogs are all booked and getting ready for a three week holiday in September in the camper van starting off at the isle of Mull. They can't wait. Tam is doing fine, he weighs 31.5 kg and is due his annual check-up and inoculation soon. Donna can't wait to take him camping in Mull with everyone. He's doing better on his back legs which is great to see, he seems to like sunbathing in the garden whilst she is pottering about which is nice . Josh, Milo and Amy all get on brilliant with him. We heard today that Tam is doing well and they are all looking forward to taking him and the other dogs on holiday with them soon. This morning Tam went to the vet for a dental. His long term fosterer said all went well and he's back home again, but a little quiet as he's still coming round from the anaesthetic. The vet removed quite a few teeth on the left side of his mouth and one of his canines. 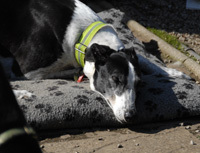 We received a message from Donna today saying they have just got back from holiday and Mike who had been looking after the dogs had to take Tam to the emergency vet last night for severe sickness and vomiting . He's weak being an old lad but they've been giving him electrolytes to help him. We heard today that Tam is feeling a little better. He's started to eat a little and is re-hydrated again, so he's going in the right direction. We heard today that Tam is feeling a million times better today . Rics made him a beef veg rice concoction and he loves it , he's getting back to his old self thank goodness . It's a worry when they are older. He was so drained, but fingers crossed he's on the path to full recovery ! Donna sent a message today saying Tam is now better and back to his normal happy self. He had his Christmas dinner today, but decided parsnips were not to his taste and left them alone.